cauliflower and cake in the same sentence? It’s my first cookie-foodie post. Is this how it begins? You see a recipe you think is awesome, you try it out then get addicted to trying out other recipes and before you know it, you can cook? I didn’t used to cook much but in the last two months, that’s changed a fair bit. No mean feat when you share a kitchen with a psycho Asian mother who seems hellbent on cooking everything with meat. As with most lifestyle changes, recently my father was diagnosed as being pre-diabetic though (and I’m no stranger to chronic illness so please don’t think this means I am not taking my father’s health seriously) this has been a mixed blessing of sorts. It means more vegies in meals! So that’s given me a little bit of rein in the kitchen. Where previously my parents would wrinkle their noses at the things I chose to cook and preferred to eat ‘their own food’ (ouch), they’re now more accepting. Meatless Mondays, I’m looking at you! Yotam Ottolenghi’s cauliflower cake I’d made one time before but felt that it had far too many eggs so I altered the recipe ever so slightly. 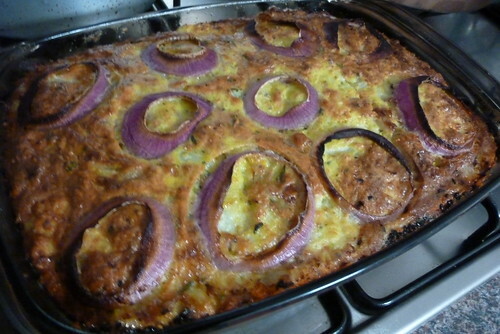 The recipe I obtained in Ottolenghi’s column for The Guardian, ‘The New Vegetarian’. And no, of course it didn’t look anything like the photo in the recipe but it was well-received: I made it when my friends Jourdan and Klara had a barbeque at their place and it was pronounced “cheesy, eggy, cauliflowery goodness”. Preheat the oven to around 180C/350F. 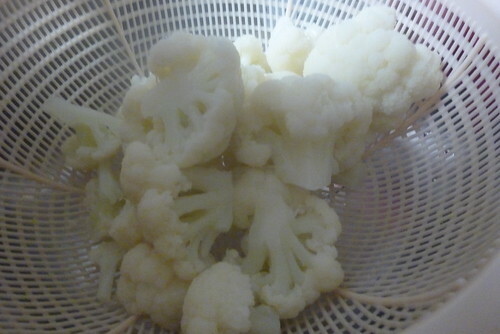 Thoroughly wash the cauliflower and cut florets off it – it doesn’t matter if they’re a bit too big because you will need to boil them for about 15 minutes or so until soft. 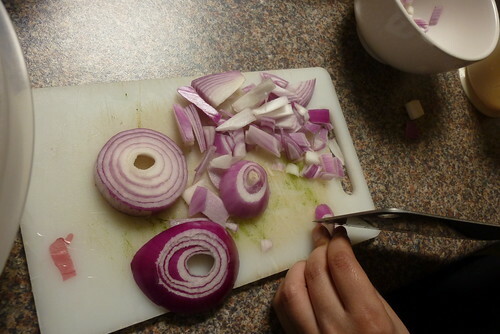 I cut fairly big florets as they break up a little when they’re boiled. 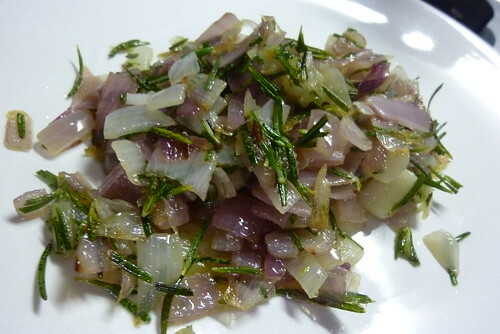 Gently saute the chopped red onion and rosemary for about eight or so minutes. I like to go overboard with the rosemary because it smells wonderful! 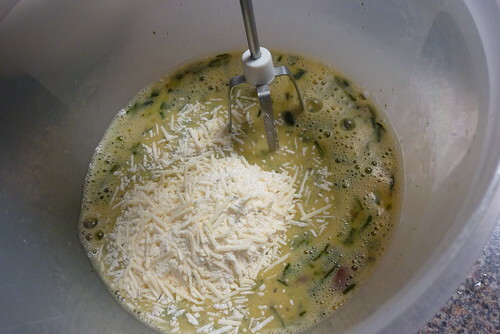 When that’s finished, set it aside to cool – you must let it cool sufficiently so it doesn’t ‘cook’ the egg mixture to which you will add it. Whip up your eggs (remember, I’ve gone from 10 to 8 eggs) and basil. When you think the above mixture is cool enough, add that too. 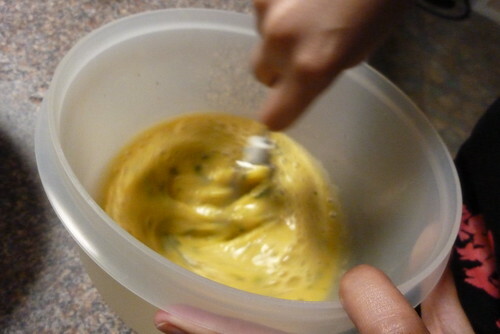 Sift the flour, baking powder and turmeric into a large bowl. 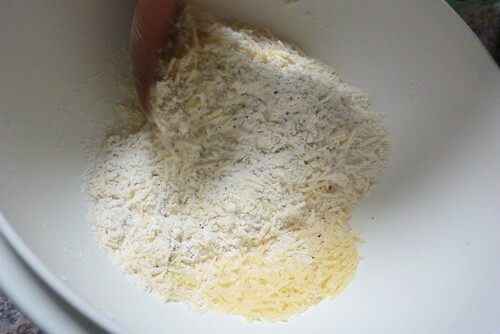 Gradually add the parmesan to this mixture then a generous amount of cracked black pepper and just a little bit of salt (I tend to favour little salt and used 1/2 tsp but you can use up to 1 1/2 tsps). 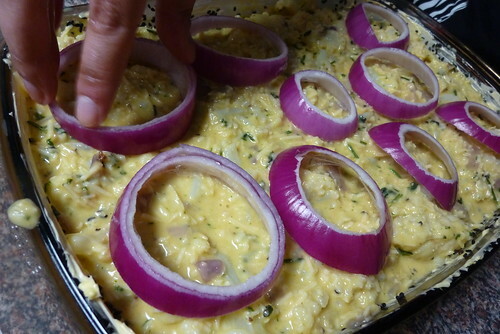 Combine the egg & onion mixture with the flour & cheese one gently and mix well to eliminate lumps. I added the dry stuff to the wet stuff in small amounts and mixed through and kept repeating till it was all mixed through. 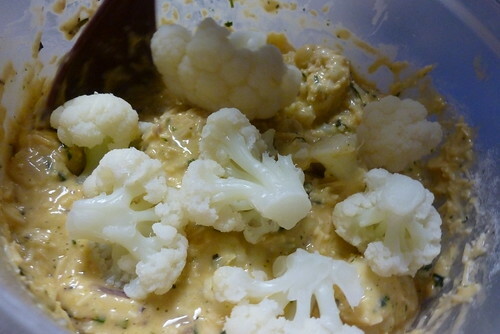 Gradually add your well-drained cooked cauliflower florets into the above mixture and stir with care. At this point you should see that some of the florets will break, as they’re nice and soft from being boiled. This is why I recommend that you break your florets up into big-arse florets! 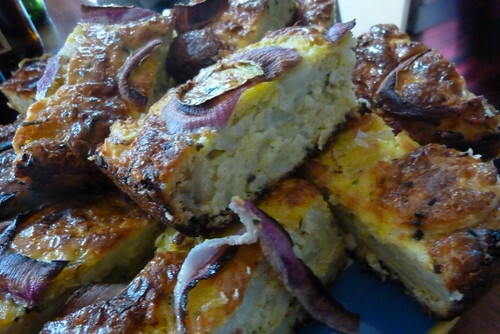 Grab a nice quiche-like dish and liberally line with butter. 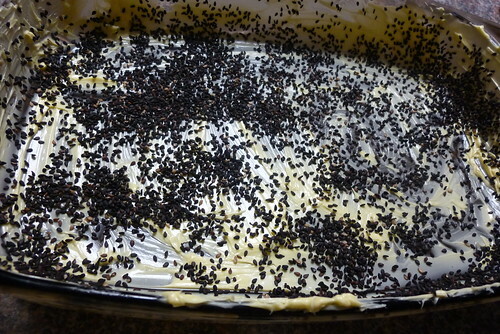 Very generously sprinkle black sesame seeds to coat the butter as if your life depended on it. On my first attempt, I did use baking paper as the recipe said, but it was really difficult to get the bloody stuff off the finished cooked cake. I was adamant that I wouldn’t make that same mistake again! 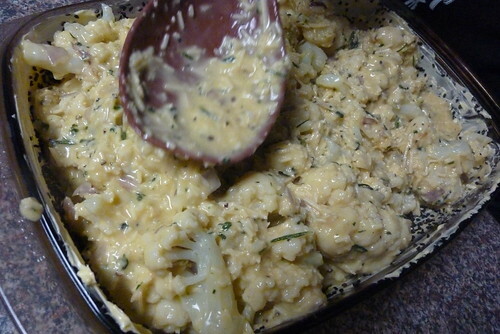 Spoon your cauliflower cake mix into prepared dish and smoosh it in to fill it up. Yep, ‘smoosh’ is the official word here. Remember those pretty Spanish onion rings you set aside? Arrange them on your mix all pretty-like. Share with friends and/or family. When I make it at home, I serve it with a mixed leaf salad dressed with seeded mustard, balsamic vinegar and a little olive oil. Seriously, even my father who is a ravenous carnivore couldn’t stop going on about how nice it looked and how good it tasted. He was pretty sure someone else had made it! I’m learning. Many thanks to my Sydney bestie L for the photos. This entry was posted in cookie-foodie antics and tagged cauliflower, The New Vegetarian, vegetarian cooking, Yotam Ottolenghi on November 30, 2010 by gem. cookie-foodie wanksters get their food on! 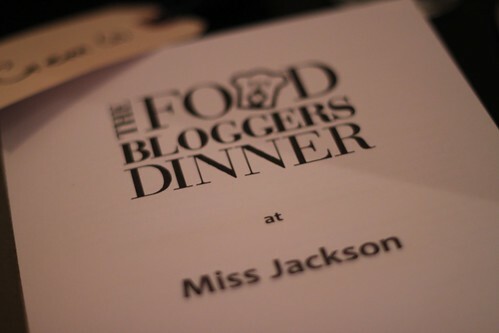 So when I heard that two of my favourite cookie-foodies Penny and Billy were going to be part of a Food Bloggers’ Dinner at Miss Jackson in St Kilda, I was giddy with excitement! Anyway, our starters! The first two were pretty representative of what you’d find as nibblies in swanky Melbourne parts – sage and white anchovy fritters in beer batter with aioli, and bresaola with goat’s cheese and cornichons on sourdough. Initially, I was going to say that my only criticism of these starters was that the sage and anchovy fritters were a dead ringer for the exact same dish that I had at The European, then I thought: wait…if I am likening this to a dish I’ve had made by pros, then Mat and Jess were doing something right! Very, very right. 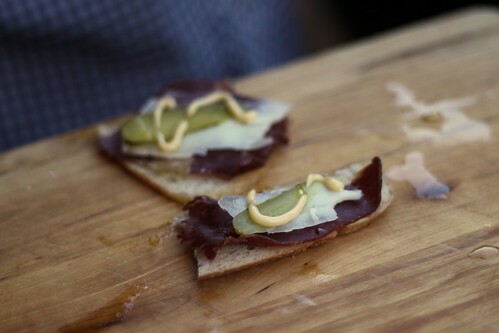 As for the bresaola…well, you know me: I am very unlikely to ever say a word against cured meats. It’s pretty much the only thing that is keeping me from forswearing meat for good. They were delicious morsels, though in scant supply. 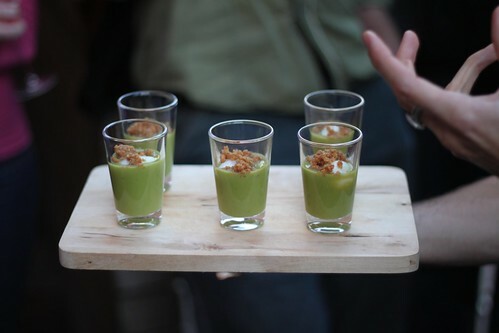 The true angel of the canapés however, was the slow cooked quail egg with a pea veloute and pork crackling crumbs. Thanks to the lovely and quick-fingered Em of one of my favourite food blogs “…it pleases us” (meeting her was pretty bloody exciting! ), I was able to scarf one down while poor Tristan snapped photos of all and sundry. He got one eventually, of course. The pea soup had a velvety texture and tasted magnificent. Coupled with the quail egg which was indeed cooked to perfection, you had a seriously decadent starter. And the pork crackling crumbs! Not just ornamental, they imbued the savoury shot with the taste and smell of roast pork straight out of the oven. This little shot of heaven stayed with me a long time! The rabid masses were momentarily sated and so it was time for us to be seated. Tristan and I were fortunate enough to be seated next to the lovely Maryann and her friend Alex, the latter of whom being a non-Twittering foodie! 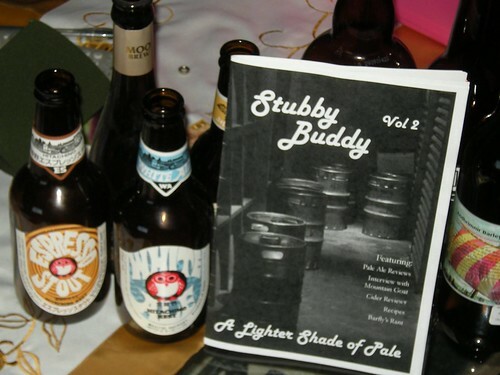 We all discussed the menu and debated fondly what our food blogger chums had in store for us. 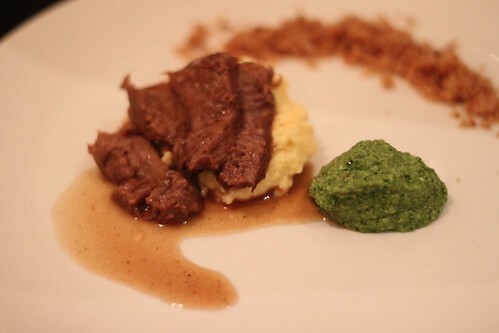 Next up on the chopping block was Penny with the entrée – double braised ox tongue served on polenta. 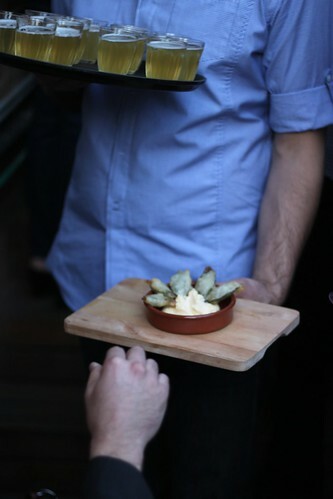 It was at this point that I met another food blogger sitting opposite us in a neighbouring alcove called Bryan. He was a bit nervous about eating ox tongue. I personally found the ox tongue to be…well, just like red meat, but more tender. Though I do confess it would be harder to eat if it arrived on one’s plate resembling a whole tongue! This dish was wonderfully rich though the polenta was just a tad too stodgy. Having said that, I’d be perfectly happy to be served this as a main. The team at Miss Jackson were responsible for wine matching the courses and with Penny’s dish they served a glass of the 2009 Hermanos Cataluna Tempranill/Mataro/Garnacha, Dromana. The pork belly, as promised, was tantalisingly infused with a slightly sweet cider taste. The pork loin was beautifully tender and its panko crust was a fabulous juxtaposition in texture. Even with the sides we were all ridiculously spoilt. 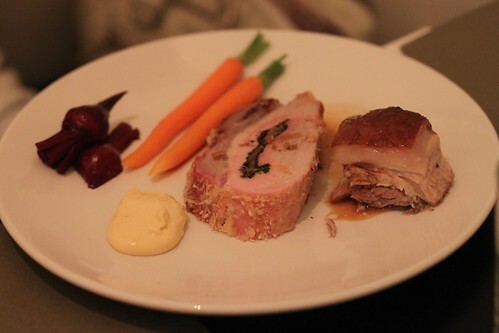 Our restaurateur hosts accompanied this part of the meal with a 2009 Holly’s Garden Pinot Gris. I might add very kindly that for all wines served on the night, we were all more than welcome to have more than one glass. That’s hospitality, yo! At this stage, a fair few of us were probably fairly full and so Ed’s palate cleanser of green tea and mint granita cheekily soused with gin was indeed welcome. Also, it looks well classy, eh? I like that if you indeed wanted to, you could jolly well make this at home. I might try my hand at it this summer. It’s time for the last course…dessert! 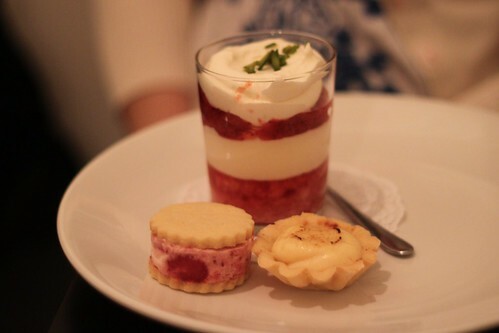 Miss Jackson’s chef Sarah was responsible for three hip-widening treats – a trifle with strawberry liqueur and white chocolate mousse, the cutest little crème brulée tart with strawberry and aniseed jam and lastly a strawberries and cream semi-freddo sandwich. Can you guess that the theme for dessert was strawberries? Mmm! Despite being full to the gills, upon the first mouthful of trifle, I regained my second stomach reserved for desserts, just like when you were a kid. Apparently, I’m a bit silly when it comes to eating trifles and didn’t do Sarah’s trifle creation justice because I didn’t mix up the layers. 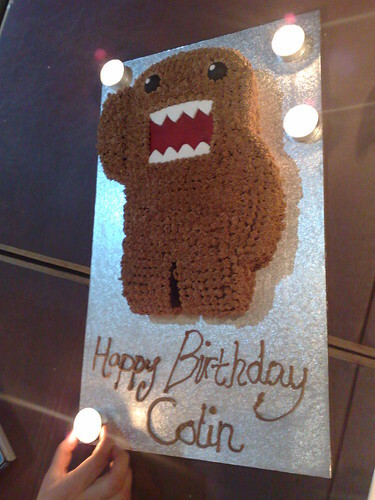 However, the other two were polished off with me oohing and ahhing. Despite being quite wine-hazy at this stage, I do remember that the 2009 Innocent Bystander Pink Moscato served was like drinking liquid strawberry sherbet! 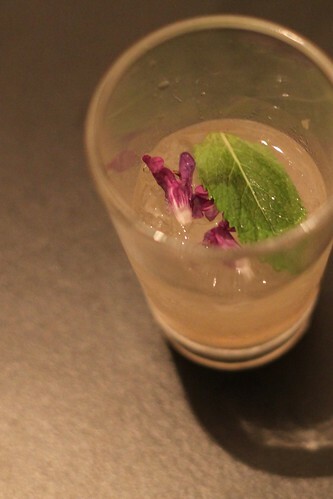 It was zesty, sour and sweet all at the same time and set off the sweetness of dessert excellently. It was still quite late when I left but the party was still kicking! I wonder how many sore heads there were the morning after…? I’m still in awe of my food blogging friends and their culinary prowess: remember, these are folks who by and large are not in the food industry. 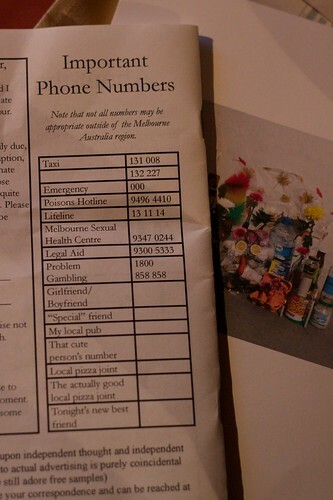 They have full-time jobs that are relatively unrelated. 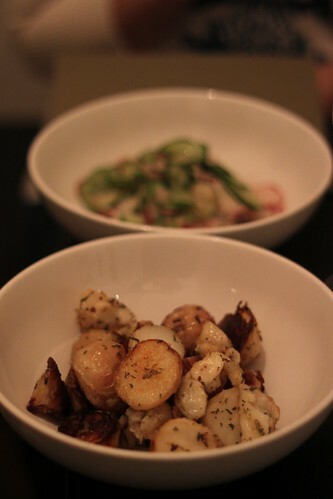 However, food is a passion for all of them and this night was definitely designed to showcase that. It was an absolute honour to be wined and dined by you all. 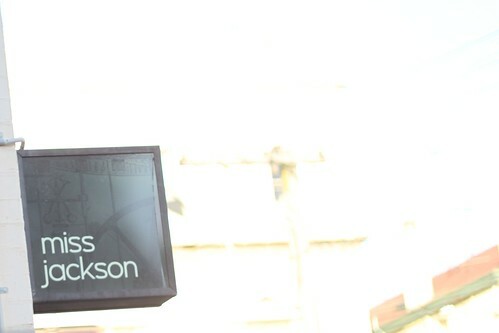 It was most gracious of Miss Jackson to open up their place to house such an event – it was a bit of a foodie-love-in! 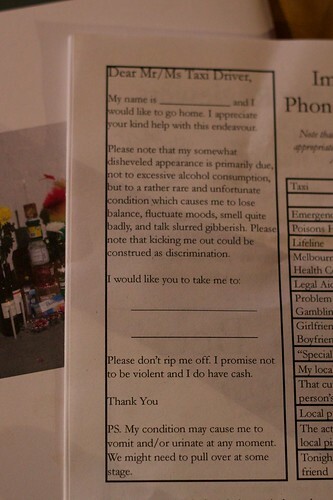 This entry was posted in cookie-foodie antics and tagged Food Bloggers Dinner, Melbourne, Miss Jackson, St Kilda on November 29, 2010 by gem.